At Glasgow Taxis we use only taxis built for the purpose and have a rigorous maintenance and cleaning programme to ensure our fleet taxis always meet the highest standards. Our taxi fleet comes under the supervision of Glasgow City Council and all taxis are comprehensively checked biannually to ensure mechanical and safety fitness standards are maintained. Council officers also carry out random inspections at Glasgow taxi ranks to ensure standards of cleanliness and other licence conditions are being met. The Glasgow Taxis Ltd. taxi fleet consists of London Taxis International TX-style vehicles, which seat five passengers, and the Peugeot Euro Taxi and the Mercedes, which are licensed to carry six persons. All of our fully disclosed and traceable vehicles can be easily identified by small yellow flags on their roofs. 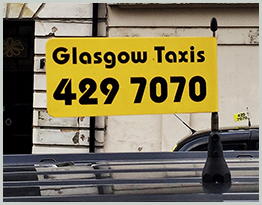 So what are you guaranteed with all Glasgow Taxis Ltd #YellowFlag vehicles and drivers? All our vehicles are equipped with the latest in radio and GPS communication technology, which means our controllers can maintain constant communication with drivers, who have a full range of satellite navigation options available at the touch of a screen.